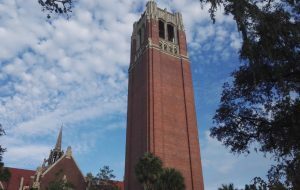 I had the exciting opportunity to study at University of Florida for Fall Semester 2017. I arrived in Gainesville, Florida late on 14th August after meeting (little did I know at the time) my soon-to-be best friend, Julia a post-graduate exchange student from Germany, at Gainesville Airport. I remember looking out of the window of the hotel I would spend the night in and repeating to myself in awe that I was in America and about to start a four month adventure. The next couple of days after I moved into Weaver Hall, the accommodation block specifically for exchange students from around the world and American students interested in meeting non-Americans, were a complete blur of meeting new people, attending introductory meetings, and exploring the beautiful campus. I had arrived at Weaver a couple of days before the official check-in day, so had the opportunity to get acquainted with my surroundings before the influx of other internationals, and my room-mate, Hallie, moved in. 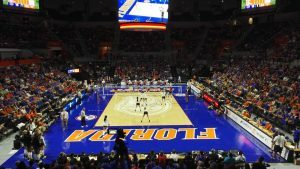 Looking back, it is unbelievable how quickly I clicked with everyone, and got involved in my Florida experience; within my first week of arriving, I had gone to clubs and bars in Downtown and Midtown, gone to a house party, and attended a pep rally which involved the Gator Band and cheerleaders. Classes started on the second week and I quickly got into the routine of two classes a day every day: one class of American History before the Civil War and another after the Civil War, a class on the History of Human Rights, and a class about Nuclear History. All of my professors were passionate about their specialities, and later proved themselves to be extremely accommodating to the new pressures I faced under a new education system and, ultimately, different way of learning. 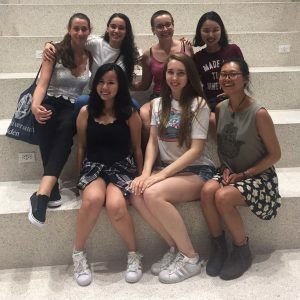 I did not realise how many new situations I would be in while moving to America – it was like when I first moved to Reading, but with a different culture that I had not experienced first-hand before. There was a new bus system, a different currency, taxes added onto purchases, and accents that were completely new to me; all in a country where I was on my own and with a negative five hour time difference to my family. This could have scared me, and I definitely felt this sensation creep over me now and again at the beginning of my time in America, but ultimately I was excited and amazed that I was living and studying on my own in a different country. After the first week of school, I attended my first Gator volleyball event, spent the day at Lake Wauburg, and went to the mall with Julia. On Labor Day, Julia, Sam, and I went tubing (using big, rented, inflatable rings) in Ichetucknee Springs. The springs were the most beautiful place I have been in my life, and I had my first glimpse at baby alligators. I also had three dragonflies land on me as I drifted lazily down the springs. I was overwhelmed at the beauty I had only seen in nature programmes on television, and could not believe I was experiencing such wonders myself. The first few weeks at University of Florida taught me how important it is to balance school and fun, as I attended events and met friends who would remain close to me throughout my stay in Gainesville. Although I am writing this in retrospect, I hoped this experience would remain as joyful as it had been so far – and do you know what, although there were difficulties at times, it did. 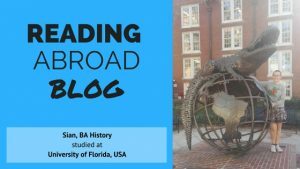 This entry was posted in University of Florida, USA Study Abroad. Bookmark the permalink.